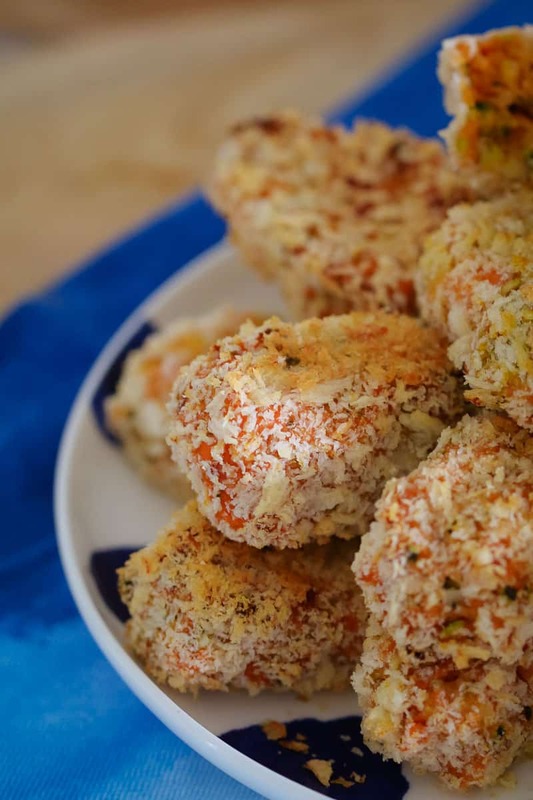 These 4 ingredient Healthy Sweet Potato & Zucchini Nuggets are perfect for toddlers and kids! A quick, easy and delicious recipe. When my son Will started eating solids, he would eat absolutely anything I gave him. And I hate to admit it, but I was definitely one of those people who happily let the words ‘oh my son eats everything’ tumble out of my mouth (far too many times). But in true kid-style, Will decided to make me eat my words. Big time. At about 16 months, my usually happy little eater totally changed and decided that he didn’t want to eat anything anymore (well except for bananas and yoghurt!!!). And it totally threw me!! My husband and I aren’t fussy eaters at all and so I thought our cruisy eating habits had rubbed off on Will… apparently not! Suddenly, he wouldn’t touch foods that he used to love. And heaven help me trying to get him to eat vegetables. Kids!!! They certainly know how to keep you on your toes. Anyway, this sudden fussiness (that’s what I’ll call it!!) made me try desperately to get Will to eat.. well anything, really!!?? But I tried extra hard with veggies. I made them in every single texture, shape, style you can imagine. Some led to a few little nibbles (whoop whoop!! ), and some were totally discarded (grrrrr!). 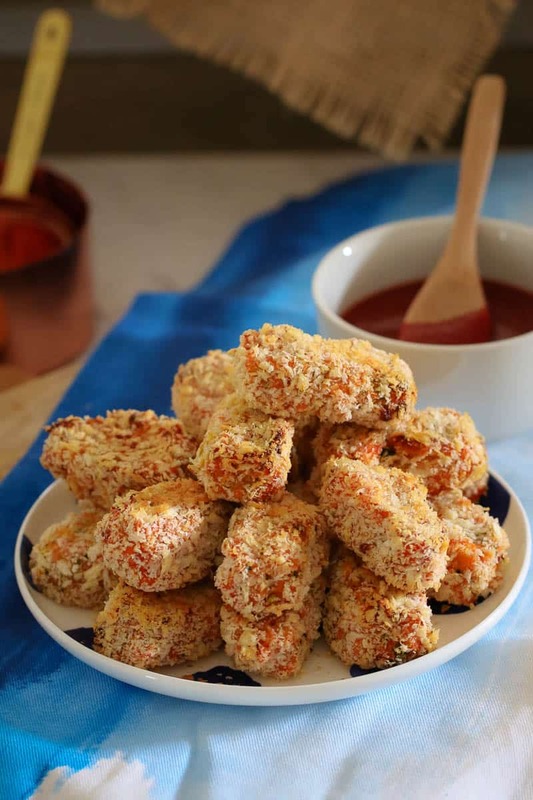 Thankfully these Healthy Sweet Potato & Zucchini Nuggets made it to the little nibble stage. I’m certainly not saying that Will ate heaps of these (or even 1 full nugget for that matter!! ), but we got a few bites in, so that was a win! 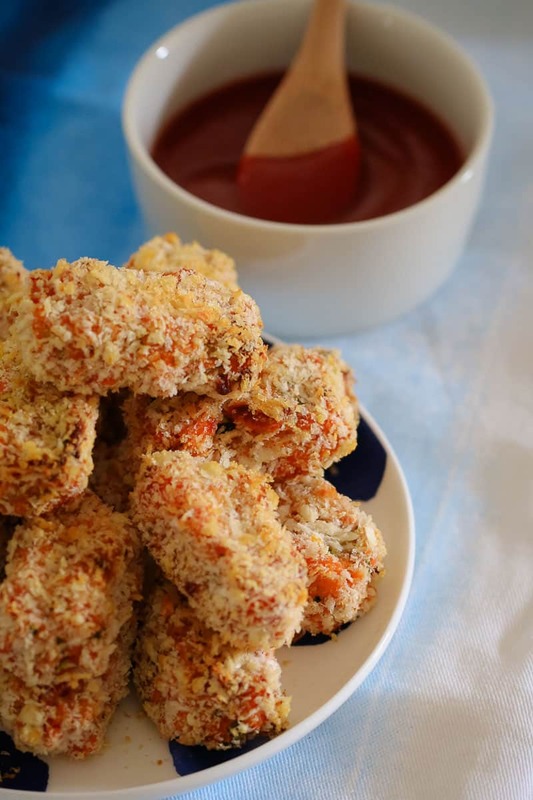 Whether your like me and you’ve got a (fussy) little toddler in your house or whether have a kid that will eat anything (trust me, you are so, SO lucky), then these Healthy Sweet Potato & Zucchini Nuggets are brilliant. 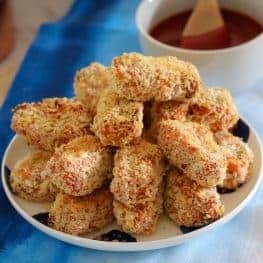 They’re the perfect finger-food size, can be dipped into sauce or mayonnaise, and are super crispy on the outside but soft on the inside. YUM! They’re also freezer-friendly which is great when your little one eats like a bird – you can just grab 1 or 2 out at a time and reheat. Perfect!! For now, I am trying to relax about Will’s eating and hoping (like anything) that it’s just a phase. Until then, I’ll be smuggling veggies in wherever I can… and hoping for a few nibbles here and there!! Do you have a fussy toddler in your house too?? Do you have tips to share?? Want some other toddler-friendly recipes? Check these ones out! Or have a browse through my entire Kids & Toddlers recipe section here. 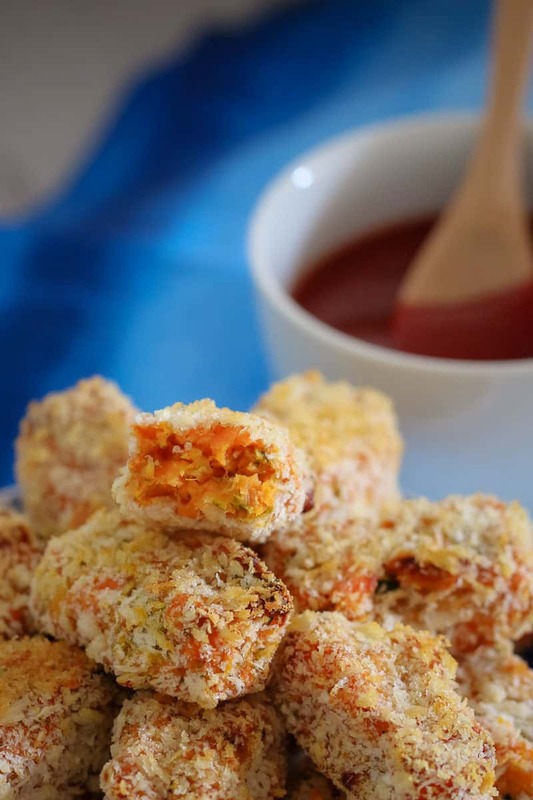 These 4 ingredient Healthy Sweet Potato & Zucchini Nuggets are perfect for toddlers and kids! 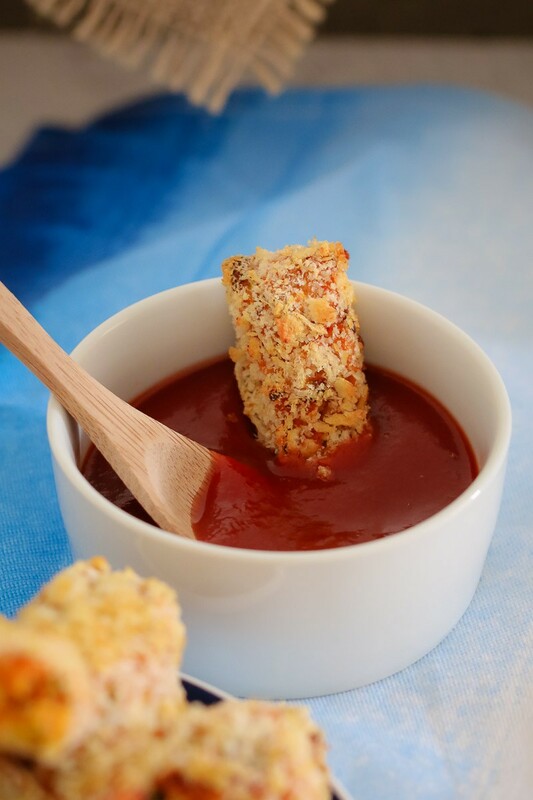 Quick, easy and yum! Preheat oven to 200 degrees celsius (fan-forced). Lightly grease 2 non-stick baking trays and set aside. Peel and cut the sweet potato into chunks. Boil in a saucepan until tender. Drain well and place into a bowl. Mash with a fork. Add the drained zucchini (see note) and the grated cheddar cheese. Mix until well combined. Take tablespoon-sized spoons of mixture and shape to resemble a 'nugget'. Coat in the pink crumbs and place onto the prepared trays. Lightly spray with cooking oil and bake for 20 minutes. Turn and bake for a further 20 minutes or until slightly crunchy on the outside (the nuggets will be soft on the inside). Serve with sauce or chutney. Store in the fridge for up to 3 days or freeze in an airtight container for up to 2 months. Drain all of the excess moisture off the grated zucchini by placing into a strainer and squeezing with a tea towel or paper towel. Wow, sweet-potato-zucchini looking, colorful, Thanks for sharing delicious and tasty recipe!! 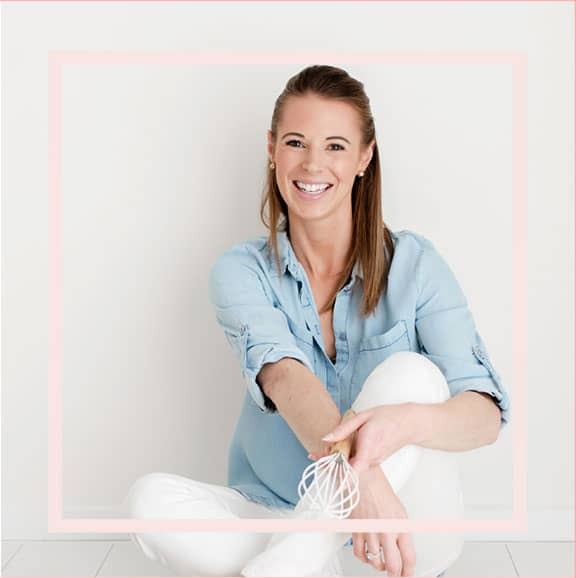 Hi Casey, I actually find this recipe is quicker to do without a Thermie lol! But you could always grate the cheese and zucchini in there! Would you be able to cook these in an air fryer? Thanks for this recipe. Definitely going to try it and am saving it to my Pinterest board for reference. 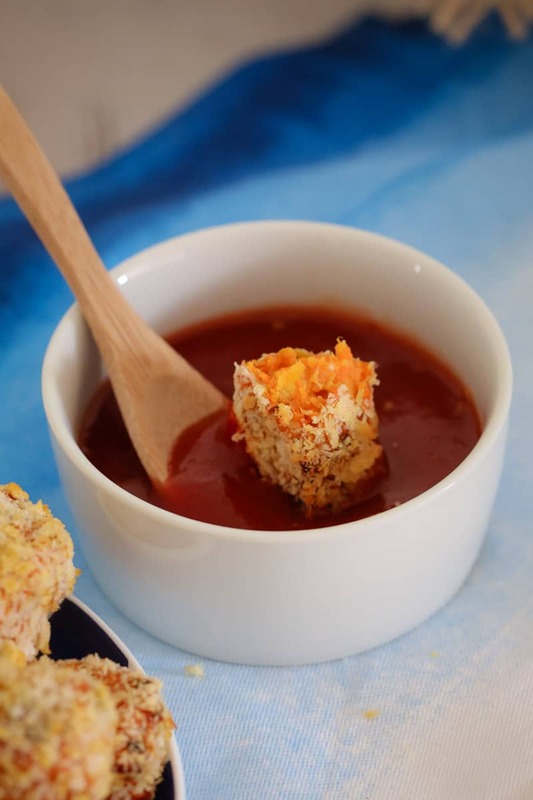 This is so healthy and just the thing for those little taste buds that can be so fussy. cheers.